That being said, don’t be fooled, there is a tremendous amount of evidence pointing toward the fact that some of these UFOs, whose presence were officially acknowledged within the mainstream using declassified documents and hundreds of high ranking military/political whistle-blowers, are indeed extraterrestrial in origin. There is ample evidence suggesting that many are ‘ours’ as well.We’ve written about this quite extensively, and if you want to learn more about that and sift through all of the evidence we’ve accumulated over the past 8 years, please visit the exopolitics section of our website here. Another great place to start is with UFO researcher Richard Dolan. Here’s Morales’ statement on what he experienced from his Facebook post:“As I was driving back to Phoenix this evening, I was a few miles past Parker, AZ when I saw a shooting star with a green hue in the corner of my eye. I kept driving for a few miles and noticed a small orange light far in the distance to my right. At first I thought that maybe a meteor had hit nearby and set a fire in the desert or possibly a distant antenna light.I didn’t quite think much of it and continued to drive for another three miles. I noticed that the light was gone. I drove another half of a mile and I saw the light appear again. This is when I realized that whatever this was, wasn’t normal.I was about a quarter of a mile from the crossing between Highway 72 and Highway 95 between Parker and Quartzsite, Arizona. I immediately pulled over and attached my camera to my tripod. 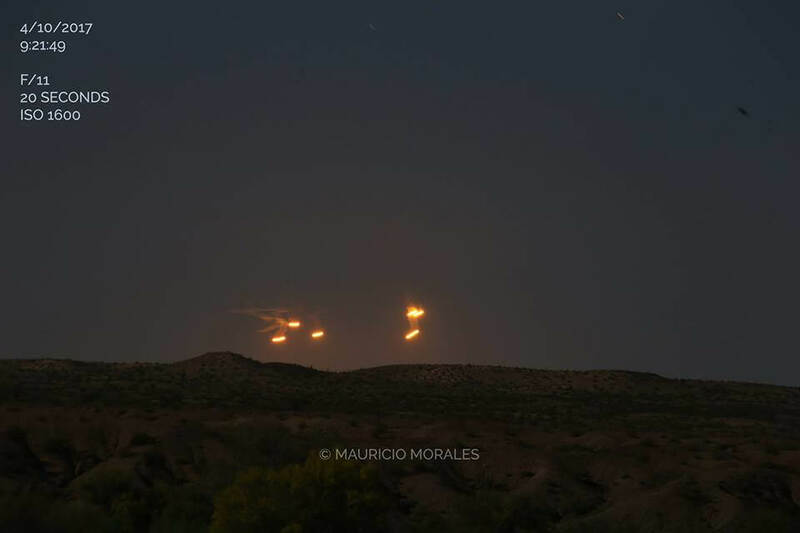 To my SW direction, there were six orange-red lights floating around in the horizon. Some of them would dim out and then brighten back up, others just seemed to float and hover away slowly. They seemed to travel in a parallel pattern with a very bright fiery glisten. I took photos and videos and in less than 15 minutes, the mysterious objects vanished without a trace.All of the photographs are timestamped and are not edited whatsoever. The video is slightly cropped for better viewing. Very interesting to say the least. Many have called out the official explanation that these are ice particles as bogus, and at the 23 second mark to approximately 35 and beyond, you’ll see why.